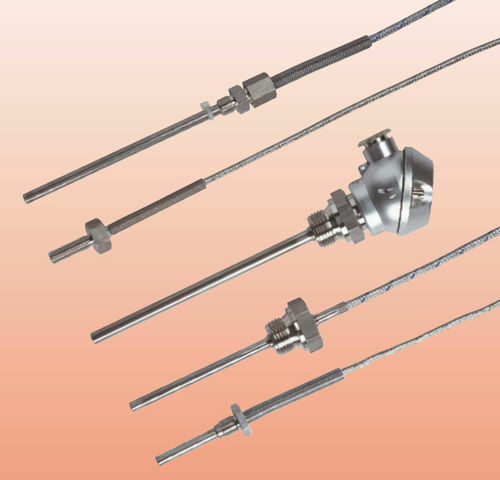 This line of screw-in resistance thermometers consist of a rugged sensor manufactured from stainless steel that comes with a fixed or sliding thread, and the electrical connection of these units is made from a connecting lead or a connection head of form MA. The connecting leads are generally suitable for dry or moist rooms, but this will depend on the version being used. The junction between the connecting lead and protective tube strain are fitted with bend protection, and the protective tube and process connection are manufactured from stainless steel for durability and reliability. However, buyers can choose alternative material options on request, and these devices utilize PT 100 temperature sensors that are in accordance to IEC 751 category B.